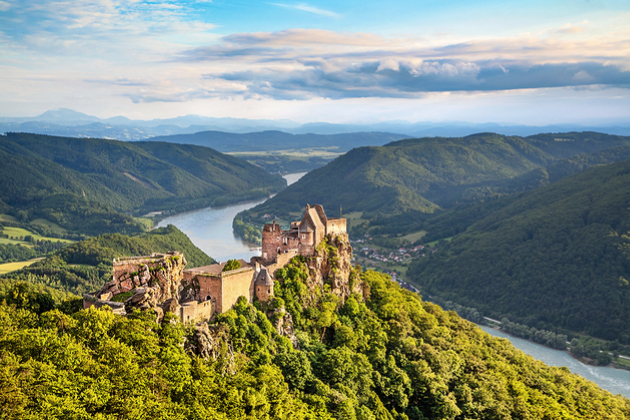 The only major European river to flow west to east, the Danube River originates in Germany's Black Forest. You can sail on it to eight countries: Austria, Bulgaria, Croatia, Germany, Hungary, Romania, Serbia and Slovakia. It then divides into three main branches, called the Danube Delta, before reaching the Black Sea. Springtime in Europe can get quite rainy, and there's often still a chill in the air; bring layers. The spring months can lead to flooding on parts of the Danube, due to the snow melting in the mountains. If the water gets too high, riverboats aren't able to pass under narrow bridges or through certain locks. In those cases, river cruise lines often transport passengers to sites by bus. The summer months can be hot and crowded in central Europe, but on the flip side, you have longer daylight hours to sightsee. Bring loose, breathable clothing for city walks, and look for river cruises that have dipping pools to cool off. Buses are often over air-conditioned, so you'll want to bring a light sweater. If the summer is extremely warm, water levels can get low; if there's not enough water to sail safety, river cruise lines will again transport passengers to sites by bus. The nights are shorter and the temperatures lower, but fall is an ideal time to visit. Water levels have generally straightened out, the crowds are gone, the fares are cheaper, and there's a nice chill in the air. Bring layers. Christmas Markets in the cities along the Danube make a cruise at this time of year downright magical. Yes, it's cold, but there are gluhwein and cheer to keep you toasty. Shoppers will love it. Bring winter coats, hats, gloves and other ways to stay warm -- it does snow.